In 2017, Browns defensive coordinator and now interim head coach Gregg Williams made a strong push for the team to take Texas A&M pass rusher Myles Garrett with the No. 1 overall pick rather than take a quarterback. On Friday, he reiterated that stance, saying he would still take the standout defensive end over quarterbacks like Deshaun Watson, Patrick Mahomes and Mitch Trubisky, Mary Kay Cabot of the Cleveland Plain Dealer writes. Regardless of what he would or wouldn’t do, it looks like the situation is going to work out well for the Browns. Instead of taking a quarterback a year ago, the team tabbed Baker Mayfield with the top spot and have recorded the same amount of wins this season as the previous three combined (four). Though the Packers need to win out and get plenty of help to get to the playoffs, team CEO Mark Murphy wrote in a week Q&A on Packers.com that he is not ready to give up on the season. “Now, I realize that we are 4-6-1 (and as Bill Parcells famously said, “You are what your record says you are”) and that we haven’t played well. However, we still have almost a third of the season left to play. I know that the odds of making the playoffs are slim (I’ve seen odds range from 3 to 15 percent), but we still have a lot to play for.” Like the odds say, there isn’t much left on the line unless the team can get hot and get some help. With the quarterback carousel of the 2018 offseason winding down, it is now time for team’s with entrenched signal-callers to review their current deals. At the forefront of that list is Packers quarterback Aaron Rodgers. The two sides have been long expected to come to an agreement on a new deal this offseason and Packers president Mark Murphy still expects a new deal to get done this offseason, Chris Roth of WBAY-TV in Green Bay tweets. It only made sense for Rodgers to wait for Kirk Cousins to set the bar, and he did that when he inked a three-year, $84MM deal with the Vikings earlier this month. Currently, Rodgers’ 2013 extension — which runs through 2019 — pays him $22MM annually. He can expect that number to inch close to an annual salary of $30MM. 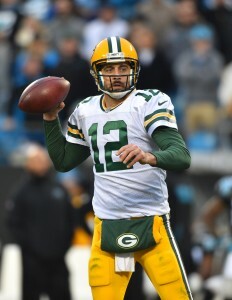 Before missing nine games in 2017 with a collarbone injury, Rodgers had played in all 16 games in three consecutive seasons. During that time, the Packers great earned three Pro Bowl selections, a First Team All-Pro nod and claimed league MVP honors in 2014. The Giants trade of defensive end Jason Pierre-Paul does not mean the team is dead set on taking his replacement with Bradley Chubb at the No. 2 pick in the upcoming draft, SportsNet New York’s Ralph Vacchiano writes. He says the move was simply the team dumping JPP’s contract, and the team is happy to move forward with Olivier Vernon, Kareem Martin and Josh Mauro. That being said, the team could still nab the N.C. State standout if it is not sold on a quarterback or wary of taking a running back in Saquon Barkley. The Falcons could be bringing back safety Kemal Ishmael, ESPN’s Vaughn McClure heads (Twitter link). The versatile hybrid safety has spent five seasons with the Falcons, starting 20 of his 65 career games. In 2017, Ishmael logged one sack and 24 tackles in 16 games. Among several other spots, the Saints can also stand to improve their wide receiver corps, The Times-Picayune’s Larry Holder writes. The team is locked into Michael Thomas as the No. 1 of the future, but the Saints could also bring in a veteran like Jordan Matthews or address the position in the draft, according to Holder. The writer also mentions running back, tight end, fullback and defensive tackle as positions that need to be improved upon. For the first time all season, the Vikings will have all three of their quarterbacks healthy when they host New Orleans on Sunday. Even with the return of Sam Bradford and the health of Teddy Bridgewater, Case Keenum “is the guy” reports Pro Football Talk’s Mike Florio. This should come as no surprise, as Keenum has been among the league’s top signal-callers since taking over for Bradford early in the season. The question, however, will be if the team wants to have all three suit up on Sunday. Florio’s sources say that won’t be determined until right before kickoff. Florio thinks untimely concussion evaluations could play into the decision. Regardless of the decision, Keenum will have as long a leash as possible as the starter. The sixth-year quarterback enjoyed a breakout campaign, throwing for 3,547 yards and 22 touchdowns while posting a stellar 98.3 passer rating. It is unknown at this time if Bradford will leapfrog Bridgewater for the backup role. Vikings offensive coordinator Pat Shurmur is the perfect candidate for the Cardinals head-coaching vacancy, AZ Central’s Dan Bickley writes. Bickley notes Shurmur’s ability to get the most out of his quarterback as the underlying factor. He also thinks the hiring of Shurmur would ensure the return of Larry Fitzgerald. The hiring, however, would go in opposition to former head coach Bruce Arians’ wishes that defensive coordinator James Bettcher get the job. 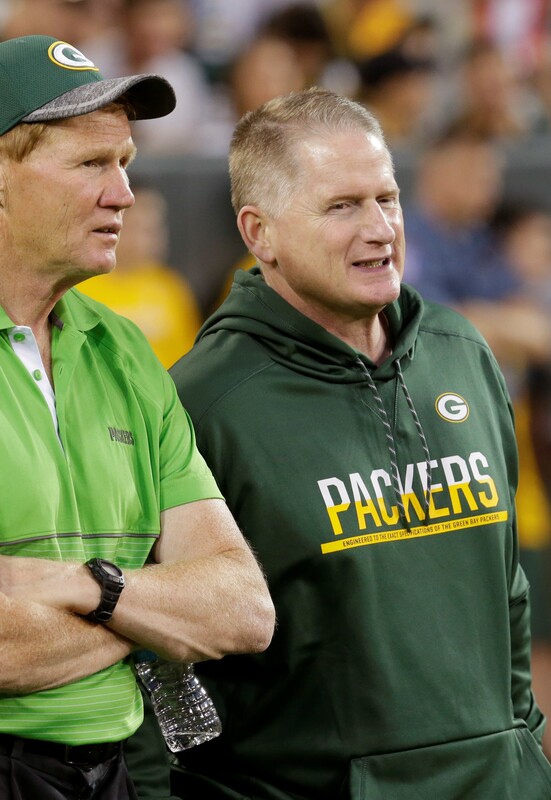 Packers head coach Mike McCarthy reportedly met with team president and CEO Mark Murphy and expressed concerns Russ Ball wouldn’t be aggressive in free agency, USA Today’s Pete Dougherty reports. The meeting in theory caused Murphy to not promote Ball to general manager after Ted Thompson left the spot. Dougherty has doubts that the meeting had any impact on the situation. He also laid out another theory that Murphy preferred Brian Gutekunst all along for the job. There is confidence on both sides that the 49ers and Jimmy Garoppolo will strike a deal, NBC Sports’ Matt Maiocco writes. If the sides don’t reach an agreement, it’s almost a guarantee that the quarterback will be franchised. After leading the Niners to wins in each of his first five starts, Jimmy G is a safe bet to be the QB in San Francisco for a long time. An offer for a prominent Packers job is on the table for Eliot Wolf, Tom Silverstein of the Milwaukee Journal Sentinel reports (on Twitter), but it’s uncertain he accepts it at this point. Before the sides can progress on a deal, the 35-year-old exec must determine if he wants to stay in Green Bay. Wolf was bypassed for this job after withdrawing his name from consideration for the 49ers’ GM position last year, and the Browns are expected to pursue him. Wolf worked with John Dorsey for several years before Dorsey became the Chiefs’ GM in 2013. New Green Bay GM Brian Gutekunst said Monday (via Rob Demovsky of ESPN.com) he wants Wolf to remain on staff but acknowledged executive has other opportunities. Here’s more from Green Bay and the latest from the North divisions. Team president Mark Murphy said (via Demovsky), however, if a decision is made to ultimately fire McCarthy, he will make it and be responsible for hiring his successor. Other than that, Murphy said he will not meddle in football decisions. Silverstein notes (via Twitter) the previous arrangement involved all football parties answering to Thompson whereas this one could leave some uncertainty with Gutekunst, McCarthy and Russ Ball each reporting to Murphy. Ball has been given a title bump and now has a more direct line to Murphy. McCarthy’s comments last week about the next GM being a “good fit” may have been a shot at Thompson’s free agency-phobic tendencies, Silverstein writes, adding they also may have induced the Packers to contact the Seahawks about a John Schneider interview. While Seattle blocked that move, Silverstein notes McCarthy’s comments may have prompted Murphy to hire Gutekunst in order to see the team take a more proactive approach to stocking the roster in free agency. Silverstein writes Ball was expected to approach free agency like Thompson, his mentor, so this decision could be interpreted as McCarthy getting his way. While Gutekunst worked under Thompson throughout the latter’s tenure, Silverstein writes that other execs who received opportunities elsewhere — Schneider, Dorsey and Reggie McKenzie — were not shy about signing free agents.